« What Is a Right? This entry was posted on Tuesday, August 16th, 2011 at 12:15 and is filed under Barack Obama, Economics, Politics, Sarah Palin, War. Praying for Aliens or War? There was a time when a Nobel Prize meant something. 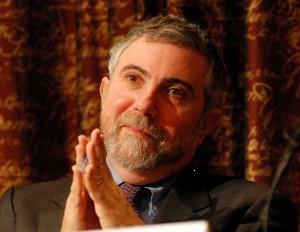 Paul Krugman is a Nobel Laureate in the field of economics, but he’s most well-known for his economic propaganda on behalf of leftist ideas. He appeared on Fareed Zakaria’s show to propose the preposterous, meanwhile making an admission that is not only damaging to his long-held Keynesian notion of “pump priming,” but also inadvertently destroys the leftists’ notion of how the U.S. finally clawed its way out of the Great Depression. Krugman has argued that the United States was able to climb out of the pits of depression by the massive stimulus spending of FDR. FDR’s many make-work programs and vote-buying schemes like the CCC and WPA jobs seem suspiciously like the ideas President Obama is now proposing. Krugman explains that if we were invaded by aliens, the stimulative effect would get us out of the prevailing pathetic economic environment of the moment. Unfortunately, what he’s also saying is that a war would be good for the US economy, and once again, he misses the mark entirely. What lifted the US out of the Great Depression was when we began to supply England and Russia, among others, with the materials of war in 1939 under the Lend-Lease Act. We would not actually enter the war ourselves until more than two years later, and so in effect, the US was growing its economy on the basis of war-time production without yet being in a war. This is what got the US out of the Great Depression, but the problem is that we needn’t have a World War erupting in order to bring us back from this brink. Consider what this demonstrates: In 1939, our government already knew Keynesian “pump-priming” was nonsense, and still, after all the years between, with all the evidence necessary to demonstrate the facts, commencing in early 2009, the Obama Administration decided to start again that practice which history had already condemned as a failure. There was Paul Krugman, Nobel Laureate, urging his recently-minted fellow Nobel Prize winner Barack Obama to carry on where FDR and the New Dealers had stopped. Among all the other things this may lead you to wonder, the value of a Nobel Prize may now rightly be questioned. In his commentary, Krugman admits borrowing a plot in which scientists fake an impending alien threat to achieve world peace. Let me assure you that you cannot fake prosperity, and of all the lessons of the last century, this idea ought finally to be discarded. Mr. Krugman is another economic propagandist, because what he does not mention is that the reason the US was able to prosper on the sales of war materials prior to entering the war was precisely because we enjoyed a competitive advantage among the producers of war goods at the time. We had vast, untapped resources of workers and raw materials that could quickly be turned into the equipment fighting men around the world needed to go into battle. Unless we happen to have some particular weapon more able to repel aliens, or are able to deliver it to customers more inexpensively and reliably than our competitors, and unless the aliens decide to leave the U.S. alone for a while as they plunder the remainder of the globe, it is not possible to understand how Mr. Krugman’s fanciful suggestion bears any relevance on the reality under which we now suffer. Perhaps rather than accost Americans with fantastic ideas about how war can rescue us from ourselves, Mr. Krugman can instead try his hand at real economic ideas that have withstood the tests of time, because his own have not, and he knows it. Mr. Krugman was among the number of Lame-Stream Media critics who last year pilloried Sarah Palin for her specific warnings about QE3, and we all know how that came out: As she predicted, food and energy prices have ratcheted up, and Americans are suffering from a rapidly devaluing dollar. Now the left’s chief economic propagandist, apart from President Obama, is telling us that a World War of some sort would be good for the economy. How many of you now wonder if this portends a grave future? When your leaders consider advice that offers aliens or World Wars as the solution to your economic woes, you have every reason to be concerned. These people are not interested in right or wrong, but only in victory at all costs. I would urge my fellow Americans to observe with a shrewd eye the foreign policy machinations and manipulations of the Obama Administration, looking for any evidence that they would seek to use a foreign policy crisis to their domestic political ends. Given the history of this administration, it’s virtually certain that presented such an opportunity, and given their poor standing with the public at present, there may be no limit as to what they will permit themselves to do. Krugman has been a joke since his work on new Trade Theory & Economic Geography – which was actually valuable – and as you so correctly point out, he now just another shill. This is doubly embarrassing, since I teach economics and analytics on the university level and these kids think Krugman is a god or something, and Obama is Jesus Christ. So does most of the staff frankly. so I just keep my head down and keep moving. I have a creepy feeling about our current state of affairs – at times it's like 1938, which I have only read about, and at other times, like 1968 which I remember quite vividly, both being critical tipping points. And the current crew – they are like the Jacobins of the French revolution. As you say, not right, not left, just plain old crazy. I quite agree. Stupid is as stupid does- what I find frightening is all the mindless sheeple our high schools, colleges and universities keep churning out. Never doing the intellectual homework with an objective eye. I am comforted though– there are small pockets of youngsters that do see things logically with common sense, interested in history and not afraid to speak out. Let's support them when we come across them because they have a much harder battle ahead of them. Odds are stacked against them not only from their own peers but the teachers themselves and most likely most adults as well.